Milton Keynes has a lot to offer , it is one of the major shopping areas around this area, and is great for the more adventurous ­You can toboggan on real snow in The Toboggan Zone, and go indoor sky­diving. Cross the stunning Iron Trunk Aqueduct - a must for a photo opportunity. It's a magnificent Georgian structure, which carries the Grand Union Canal over the River Ouse. Built in 1811 by canal engineer Benjamin Beavan, the aqueduct stands at an impressive 10.8 metres high and connects Wolverton with Cosgrove. Stoke Bruerne is perhaps the best example of a canal village in the country, and the Blisworth stone built houses flank the canal. The warehouses and cottages along the wharf have become a canal centre. From Gayton Marina turn right back onto the Northampton Arm of the Grand Union Canal, then left towards Aylesbury at Gayton Junction. 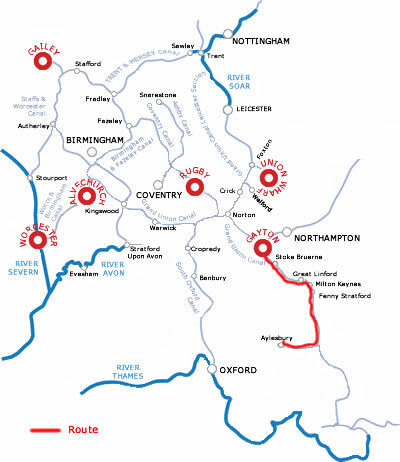 Very soon you will come to Blisworth Tunnel, at 3057 yards it is the 3rd longest tunnel open to navigation in the UK. 2 boats can pass so keep to the right. Originally the boats were legged through when it opened in 1805, and you can see the leggers hut at the south end of the tunnel. Just before this is the village of Blisworth , where there is a shop and a pub, ­ The Royal Oak situated in the village. Once through the Tunnel you come to the lovely Canal village of Stoke Bruerne, where there is a Canal museum which is worth a visit, and canal shops. There are also 2 lovely pubs and 2 restaurants in the village, so it is worth spending the 1st night here, as it is less than 2 hours from Gayton. 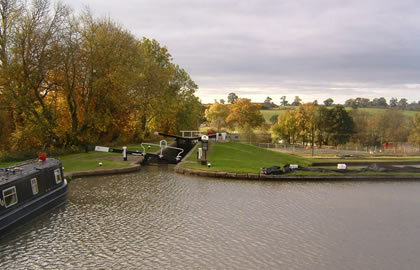 You can moor up just past the 1st lock. Stoke Bruerne is perhaps the best example of a canal village in the country, and the Blisworth stone built houses flank the canal. The warehouses and cottages along the wharf have become a canal centre. The canal museum is housed in a fine 200 year old stone warehouse and there are many exhibits detailing the 200 year old history of the canals, including a traditional narrowboat. Once leaving Stoke Bruerne you immediately encounter the rest of the Stoke Bruerne Locks­ 6 more to do. Stoke Park is 1⁄2 mile west of the canal at lock 20. Stoke Park house itself was destroyed by fire, but the pavilions & colonnade survived and are open to the public together with the gardens throughout August 3pm­-6pm. The canal then meanders through open landscape in its journey down to Milton Keynes, the village of Grafton Regis is about a mile walk from Bridge 57 and has a pub called the White Hart. The small thatch & stone village of Yardley Gobion is south west from bridge 60 , and has a stores, off licence, and pub called The Coffee pot. The Navigation pub is canal side by Thrupp Wharf at bridge 64. At bridge 65 is the village of Cosgrove, there is a curious pedestrian tunnel under the canal, also a pub canal side called the Barley Mow with mooring(the pub is open all day). There is also a splendid stone canal bridge here, decorated in the Gothic style and built in about 1800. There is one lock to negotiate near the Old Stratford Cut, and soon you will come across stunning Iron Trunk Aqueduct - a must for a photo opportunity. It's a magnificent Georgian structure, which carries the Grand Union Canal over the River Ouse. Built in 1811 by canal engineer Benjamin Beavan, following the collapse of the previous brick-built structure, the aqueduct stands at an impressive 10.8 metres high and connects Wolverton with Cosgrove. You now start to reach civilisation with the outskirts of Milton Keynes in sight. Great Linford is a lovely village built in the traditional golden stone, it is a magnificent canal village with church, manor, farm and almshouses close to the canal. From Great Linford you can get into Milton Keynes on a 15 minute bus journey. Behind the Giffard park pub by bridge 78 there is a late opening store and an off licence. Fenny Stratford is, about 2 hours cruising away, also on the outskirts of Milton Keynes but near a train station from where you can get into the city very easily. The lock is just short of Bridge 22 and a pub is just by the Bridge. The Buckinghamshire railway centre is 6 miles north of Aylesbury, ­ a large site with miniature and full size steam railway www.bucksrailcentre.org.uk . There is a bus from Aylesbury Bus station. The Oak Farm rare Breeds park is 1⁄4 mile south of bridge 15, and has a variety of farm animals for small children to see, handle & feed, there is also a picnic and play area. Waddesdon Manor is west of the town, and is an extraordinary French renaissance style chateau with sumptous contents and landscaped gardens created by the Rothschild family. By Bus: Bus service from Aylesbury: Arriva The Shires no 16/17. It is 23.75 hours back to Gayton marina from Aylesbury, about 8 hours cruising per day, or stop at the places you stopped at on the way.